Last one for this week. Updates and everything else will be back next Tuesday. Happy Thanksgiving to you all! 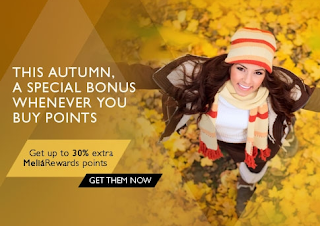 The first is from Melia International's Mas Rewards program. It is a buy points offer and while there so-so value in buying the points for actual Melia stays there can be great value in buying them for transfers to two airlines. Mas Rewards only began selling points late in 2012 and we broke the news that you could use them for getting business class flights on Air Berlin for cheaper than buying them outright (see our posts here and here) and then Jeff over Boarding Area discovered another great redemption, transferring to Miles and More for first/business class redemption within the U.S. or Canada. You can read his take on this here. The only word of warning seems to come in the comments on his piece that some people's miles that were transferred to Miles and More have disappeared from their accounts.